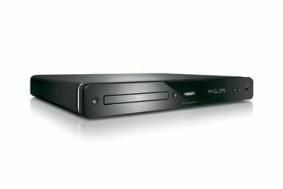 Philips launches £249 BDP7300 budget Blu-ray player | What Hi-Fi? It's a Profile 2.0 player, so supports BD-Live and has a 1GB internal memory, and delivers 1080p/24fps video content. The BDP7300 has Dolby TrueHD and DTS-HD Master Audio 7.1 decoding and an HDMI v1.3 connection. There's a USB port on the front and support for DivX, WMV, MP3, WMA and JPEG files. Last but not least, Philips is keen to push the player's quick start-up times and eco-friendly power consumpion – with just 0.2 watts of power used in standby. Due out this month, the Philips BDP7300 will set you back £249. We hope to bring you a review in the September issue.